A few times a year I go on a full-day excursion that includes a farmers market, a sausage chalet, a state park and a kitchen. It's a tradition that I believe any local or visiting tourist could easily fall in love with...I know I have. This tradition is more adventure than excursion and this particular adventure centers around Patak Meats. Patak Meats (more about them momentarily) is open to the public only one Saturday per month, the first Saturday of the month. On the rare occasion that I have the first Saturday of the month free, it's tradition time! And that always starts with a visit to a local farmers market. I've been to a LOT of Atlanta farmers markets—not all of them, but a lot—and Freedom Farmers Market at the Carter Center has become my personal favorite. In great part due to its manager, Holly Hollingsworth, as well as the awesome vendors and entertainment she brings to that particular market. You know how some people will follow their hairdresser or their mechanic when they make a change? I'm like that with Holly...I know whatever market she's managing is going to be the best, so when she accepted the position to open and manage Freedom Farmers Market, I followed her. Opening day, a few years ago now, they had more than 3,000 visitors! And they're still going strong. I'm a major foodie and I love celebrity-spotting. Combine those loves and you're regularly attending markets for their cooking demos, often conducted by local celebrity chefs. When I saw that Chef Terry Koval, Executive Chef at Wrecking Bar Brewpub, was going to be at Freedom earlier this month, I cleared my calendar so I could go. I'd not yet met Chef Terry, but I had just a couple weeks before won a gift certificate for 'Dinner for Four at Wrecking Bar Brewpub' at Party for the Parks, an annual fundraiser hosted by the Olmsted Linear Parks Alliance at Fernbank Museum of Natural History. I couldn't pass up the chance to meet Chef Terry and enjoy a sneak peek/taste of his cuisine before going to the brewpub for dinner with friends. Chef Terry is totally awesome! Before introducing myself, watching him interact with other market-goers was very telling. I totally get why my friends who know him and have been to (or are regulars at) Wrecking Bar Brewpub love it there so much. After I shared with Chef Terry that I write, he continued to be his awesome self, which is also telling. That morning, he wasn't there for a 30-minute cooking demonstration. 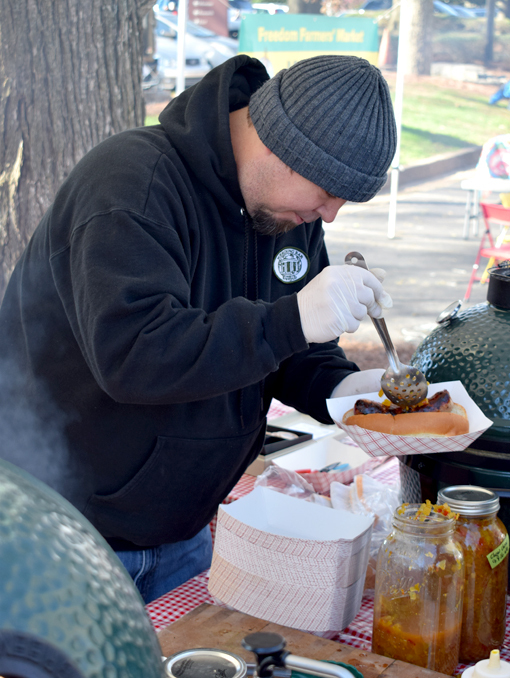 Chef Terry was there to cook for market-goers for the full four hours that the market was open! Color me impressed! 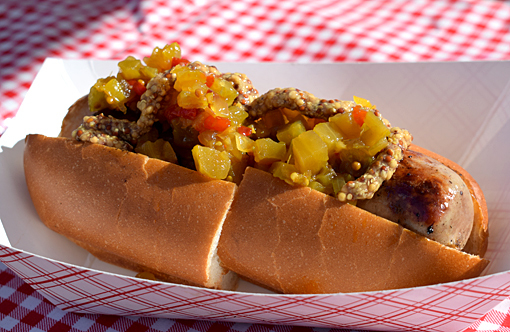 Speaking of color, he had fired up his Big Green Egg cooking up brats that he topped with house-made chow-chow relish (I'd never had it this delicious!) and Wrecking Bar Brewpub beer-infused stone ground mustard. It was the most delicious breakfast EVER! I highly recommend getting on Freedom Farmers Market's email list. They regularly update you with what's upcoming and they don't spam you with unwanted emails. AND they're open year-round! 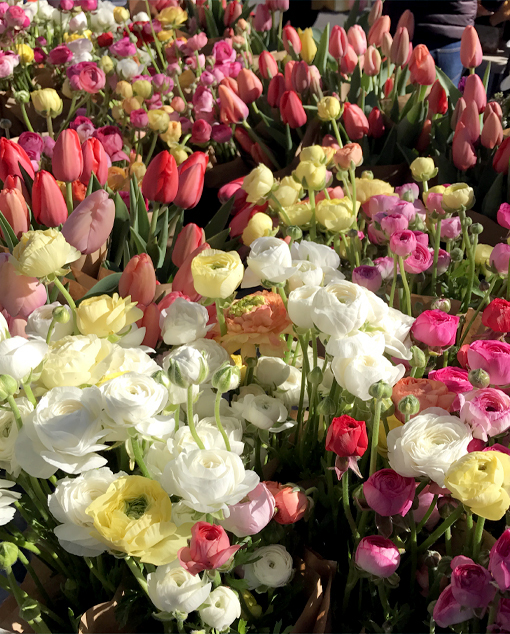 There's live entertainment, fresh flowers, it's family-friendly, has loads of vendors—of all kinds—and of course there are the weekly chef demos. Their coffee vendors are the best and I usually find something amazing for breakfast. While this visit's breakfast ended up not being a traditional breakfast item, there are amazing bakeries and other food items available for immediate enjoyment. I almost always find something unexpected, too. On this visit it was a cookbook, but I'll tell you more about that at the delicious ending of this post. The centerpiece of this tradition is Patak Meats. My friend Barry turned me on to Patak and now I go as frequently as possible, on those first Saturdays of the month when I can make it into an adventure! 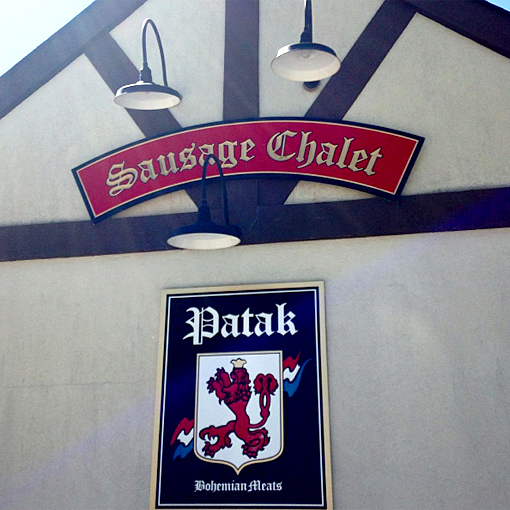 In operations since 1981, Patak Meats is of Czech and Polish origin, but offers fine European meats and sausages (and a sampling of other international items) from around the world. I usually leave with brats, different kinds of sausages, pepperoni, various salamis, cheese(s), and I very much like the sauerkraut they carry. Their prices are amazing and the quality is superior! They're open during the week, but most of us 9-to-5-ers can't get there during the week, so when you go on that one Saturday a month, expect a line. Be patient. It'll totally be worth it. The line can be quite long in the early hours, but lessens as the day progresses. The problem with waiting until later is that they might run out of what you really had a taste for. That's happened a couple of times to me when seeking their pepperoni—it's sooooo delicious! There's always an abundance, so you'll never ever leave empty-handed, but plan on making it a "tradition", because I'm pretty sure you're going to want to go again and again. Remember to bring your insulated bags with ice packs or a cooler that's already iced down, particularly if you're not heading straight home. 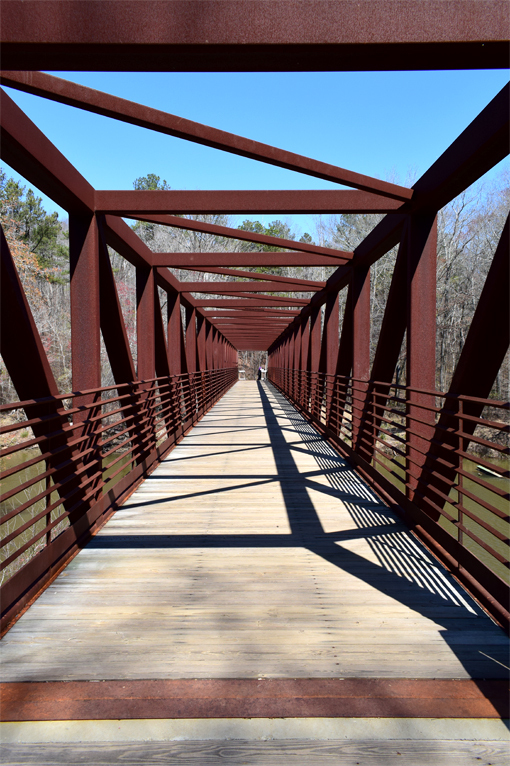 My next stop on this traditional adventure is nearby Sweetwater Creek State Park. We've often made selections at Patak Meats that we can easily turn into lunch in the Park, before exploring the trails to commune with nature (and work off the calories). There's an abundance of picnic areas, many of them waterfront. Even in March, the Park was magnificent. I've walked the Red (History) Trail on many occasions, but this time I wanted to go somewhere in the Park that I'd never visited. I took the Yellow (East Side) Trail, the one that has their famous huge metal bridge! I'd read about the Yellow Trail some time ago and remembered that there was a "bridge" on it. Well, I didn't do a refresh before heading out on the trail this particular day, so when I came across the wooden bridge along the path, I was like, "What?! That was a lot of hype for such a modest footbridge!" Then, after a couple of snapshots logic returned and informed me that the footbridge didn't cross the creek, so that wasn't the famous one. 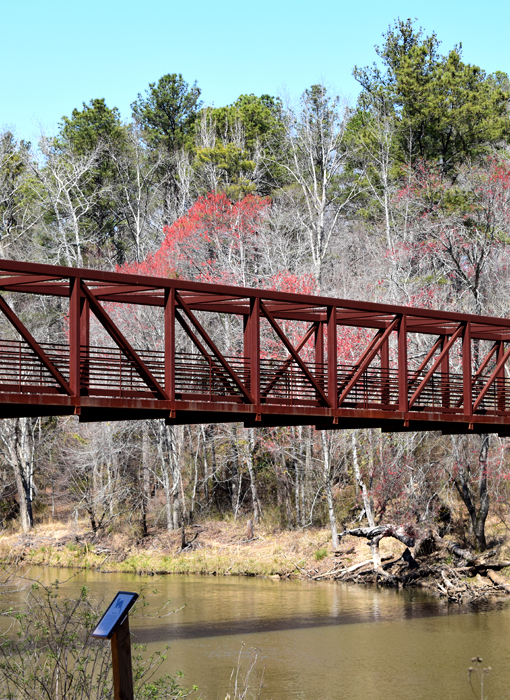 Beautiful even in winter, I can hardly wait to return in spring and summer to see the contrast between the rust color of the bridge with light, bright and dark greens of the forest. In any season, the Escher-esque experience of approaching and walking through the bridge is as fascinating as it is beautiful. 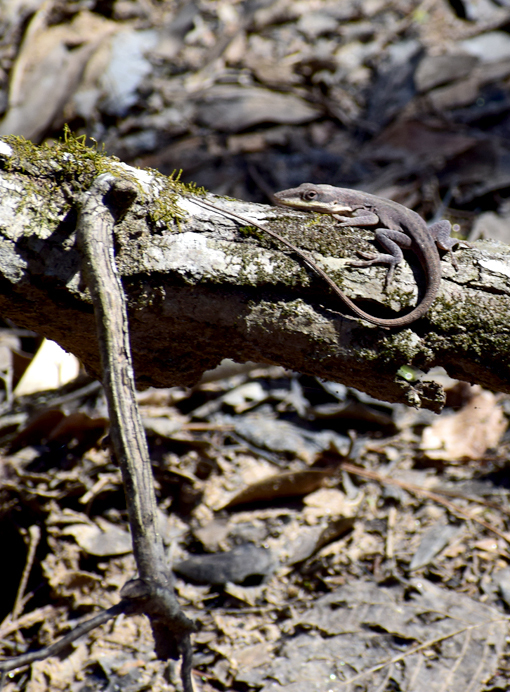 When you're exploring Sweetwater Creek State Park, keep your eye out for wildlife. You can glean a little of what you might see on the Park's website, but I highly recommend a visit to their Interpretative Center (welcome/information center) before taking to the trails. Not only do they have information about the local wildlife, they have a wonderfully appointed gift shop (with bottled water and ice cream!) and a full-fledged museum! I'm not sure what this little guy is (pictured above), but I've seen similar creatures all over the city, I think. He was startled at first, but then quickly became a ham for the camera. After visiting the Park, I headed home to enjoy my farmers market and Patak loot. I've made it a habit that any day I go to a farmers market there's a fresh meal that evening. It's a delicious habit! But on Patak days, I get to enjoy fresh produce AND fresh protein! When exploring Freedom Farmers Market earlier in the day, I saw a lovely lady at a booth featuring cookbooks. Being the foodie and cookbook collector that I am, of course I went over and investigated. 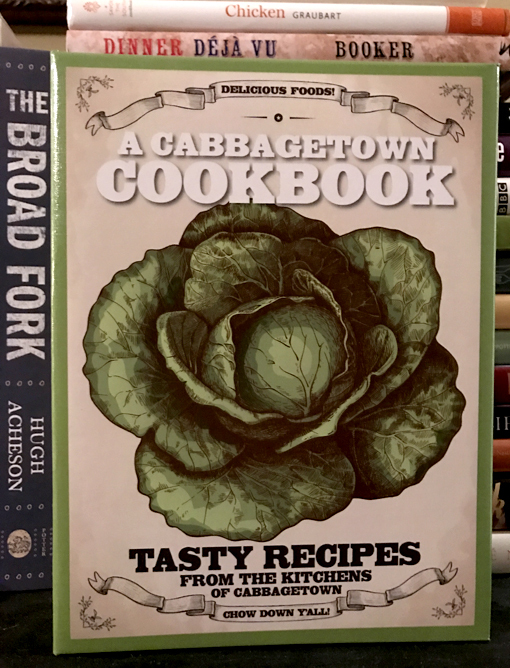 Cabbagetown Cookbook is a collection of recipes from Cabbagetown residents and the proceeds from the cookbook go towards projects that enhance the quality of life for the Cabbagetown Community, with an emphasis on the Cabbagetown Parks and their Community Center. The person selling books that day, which I didn't know at the time, is the current president of Cabbagetown Initiative, Karin Kane. 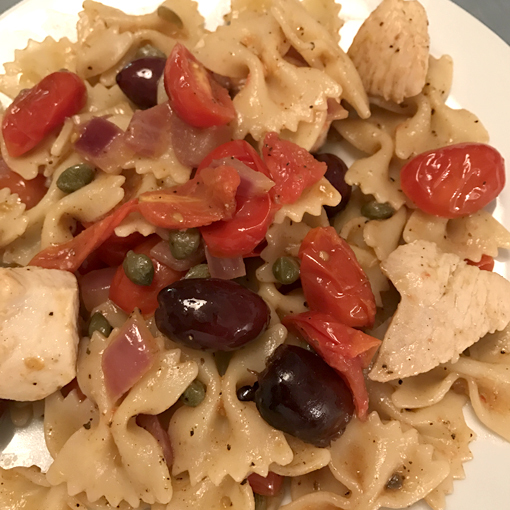 When I asked if she has a recipe in the cookbook, somewhat surprised at the question, she proudly pointed out that hers was the first in the Entrees section...Mediterranean Chicken! I purchased a copy and Karin graciously autographed her recipe page! I lived in Greece for more than two years and absolutely love Mediterranean cuisine, so dinner that night was, I determined before leaving the market, going to be Karin's dish. Not at all subtly, I framed the photo of my new Cabbagetown Cookbook by other recent local chef cookbook acquisitions, also signed by their authors. They include: The Broad Fork, by Chef Hugh Acheson; Chicken, by Chef Cynthia Graubart; and Dinner Dejavu, by Chef Jennifer Hill Booker. Farmers markets are great for chef demos, and The Cook's Warehouse is great for chef book signings—I've met all three of the aforementioned chefs at Cook's, some on multiple occasions! I did a fair amount of shopping on this particular farmers market visit, not realizing at the time that I would be using many of those ingredients to prepare a recipe from a cookbook that I purchased at the market that very morning. 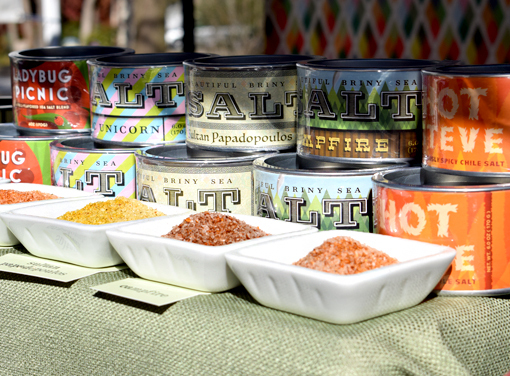 I stopped by the Beautiful Briny Sea booth and purchased the first three salts I tasted. I got the Sultan Papadopoulos (which I used with Karin's recipe), the Hot Steve (no idea who Steve is, but the salt is wonderfully spicy! ), and the Magic Unicorn, which is more universal and the one being depleted most rapidly from my cupboard. A quick word about buying and eating locally sourced food. I'm 100% behind the farm-to-table movement. It's great for the environment, it's great for the local economy, but perhaps the greatest motivator for me is that local, in-season food tastes the freshest and the food's nutrients are at their peak. Fresh is best...you just can't argue with that. Confession: I committed one of the worst home cook cardinal sins. I didn't read the recipe first! I was just too excited about the whole just-bought-the-cookbook-and-ingredients-and-now-I'm-making-a-dish-from-the-cookbook experience! No excuses...I know better. But I'm also determined. I already had most of the ingredients for Karin's chicken dish at home, but would be using chicken breast that I got at Patak Meats that morning, and Beautiful Briny Sea salt, as well as onion, and green garlic that I'd picked up at the Freedom Farmers Market that morning. I had assumed that I was making a pasta salad type dish and had already started cutting and cooking. Then I read the recipe. I backed up as much as I could and ended up getting creative in my attempt to absolve myself of previously mentioned transgression. The final dish had the elements of Karin's dish, and the flavor...Wow! Or as Karin says in the recipe itself, "YUM!" Yum, indeed! There you go, that's one of my traditions, a few times a year: a farmers market, a sausage chalet, a state park, and a kitchen. Sounds like fun, doesn't it?